But for cats, the holiday season is also filled with hazards—from visitors who leave the front door wide open to ribbons that look inviting but can wreak havoc on the digestive system if swallowed. The venerable Christmas tree, adorned with all its trimmings, poses its own set of dangers to cats. The reverse is also true. This article discusses how to help ensure that your cat and your Christmas tree are not a threat to each other. 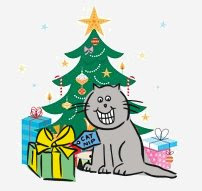 Let's focus first on keeping kitty at a safe distance from the tree, mainly for his own protection but also so you can enjoy your holiday without being woken by a big crash in the night. You've just picked out a sturdy Balsam Fir that will look magnificent in the living room. Now put yourself in the frame of mind of your cat, who's having a quiet evening at home when all of a sudden an eight-foot tree makes its way through the front door. To kitty, this is a wonderful thing that is happening; the outdoors are coming inside. Being a cat, he's going to be excited. His very own tree—he must investigate! Let him get it out of his system. Hold off decorating the tree for a day or two. Let your inquisitive feline thoroughly check out this most unusual addition to the territory; let the novelty wear off. Your cat will most likely sniff the tree with great curiosity, which is perfectly acceptable and standard cat practice. However, he's not allowed to bite on the needles. Many types of tree needles are toxic — some more than others. Shortly after bringing in the tree, spray the needles with anti-chew repellent, which you can find at most pet supply stores. The spray is not harmful to trees and animals, but it will repel kitty. Or at least it should; reactions vary. The application of repellent is a precautionary measure. Chances are that your cat won't be interested in an evergreen for lunch, but making the foliage unappealing is an easy and inexpensive safeguard. If kitty persists in munching on or even licking the needles, despite their being covered in a bitter-tasting coating, use gentle but consistent negative reinforcement to get him to stop the behavior, just as you would if he were eating any houseplant (see Train Your Cat Not to Eat Houseplants). While the tree is up, water it well, to reduce needle loss. After the holidays, take it down before it starts dropping needles en masse. Note that the risk of your cat nibbling on needles—and getting into other kinds of trouble—may increase dramatically if he's bored, especially when he's by himself. A cat with nothing to do is much more prone to engage in risky behaviors, such as chewing on the Christmas tree, in an attempt to alleviate boredom. It's imperative that you provide your cat with sufficient play, stimulation, and safe diversions. Don't put the tree near a chair or other platform from which kitty can ambush the tree—and all its decorations. That's just tempting fate. Kitty may get a notion to climb the tree, especially if he's a rambunctious kitten (as most kittens are). If you were a cat and a nice tall specimen tree was at your disposal 24 hours a day, you might get the notion, too. Even if your cat doesn't actually scale the tree, he'll almost definitely rub against it, he might bump into it while playing, and he may decide to use it as a scratching surface (trees are nature's original scratching post, and they work as well as ever). The concern with each of these activities is that the tree will come tumbling down. Make sure you secure the tree firmly in its holder. For extra stability, you can fasten the tree to the top of the wall. One way to do this is to tie one end of a cord around the tree trunk and attach the other end to a hook or picture hanger in the wall (you'll need to remove the picture for the duration, but probably no one will notice, since there will be a large tree in front of the space). Kitty will be less inclined to hang out on (or in) your Christmas tree if he has his own tree. A cat tree, that is. A tall, multi-level cat tree is the perfect Christmas present for your cat. Actually, it works even better as a Hanukkah present. If kitty gets his cat tree around the same time that you set up the real tree, his new furniture will serve as a compelling alternative to the Christmas tree — a cats-only place for climbing, scratching, and watching the festivities. And sleeping, of course. In general, go for a more subdued look, perhaps like something you'd see in a "country living" magazine. Above all, don't even think about tinsel! Tinsel, if ingested, can damage your cat's insides. It's extremely dangerous. The shimmering and fluttering tinsel may as well have a neon sign attached to it that says "cats—come check me out." To kitty, strings of silvery tinsel draped over the tree are an irresistible toy. One that could land him and you at the emergency veterinary clinic on Christmas Eve. Keep the bottom of the tree fairly empty. Low-hanging ornaments are likely to end up on the ground. Try to stick with shatterproof ornaments, or at least restrict breakable items to the top of the tree. Don't use sharp wire to fasten the ornaments to branches. Instead, use twist ties; if you use green ones, they'll be invisible. Cover the water in the tree's base so that your cat cannot drink out of it. Sap from the tree, as well as any chemicals that extend the life of the needles, are poisonous. Spray kitty repellent on the entire length of Christmas light wires. Along the floor, run all wires through plastic conduits, which you can pick up at nearly any office supply or hardware store. Turn on the Christmas lights only when at least one responsible adult is at home. Note that all the above precautions make the Christmas tree area safer for children and other pets, also. Cats are not into delayed gratification. If there are presents under the tree, kitty will investigate at a minimum, but may also rip open the paper and chew on dangerous ribbons and strings. Solution #1: Store presents in an area of your home (or outside your home) that is cat-inaccessible. Solution #2: Forego ribbons and strings when wrapping presents if they will be in kitty's domain for any length of time. Note: It is recommended that you hide catnip toys (you are buying kitty lots of presents, right?) far out of kitty's reach unless you want the celebration to start early. Pre-cat, you may have shunned the idea of a "fake" Christmas tree. But cats alter the equation. With an artificial tree, you don't have to worry about needles, or water, or sap . . . plus you can re-use the same tree year after year and improve your ecological karma.